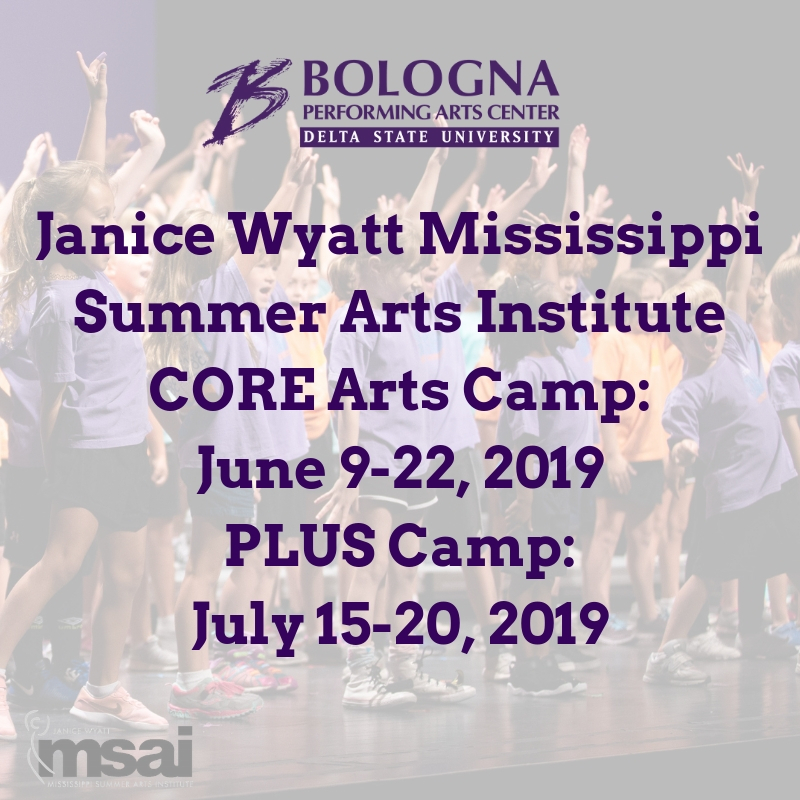 The Janice Wyatt Mississippi Summer Arts Institute is a series of summer camps hosted by the Bologna Performing Arts Center every year for children ages 5-18. The programs offer a variety of arts education opportunities for campers, focusing on performing, visual, digital, and literary arts. 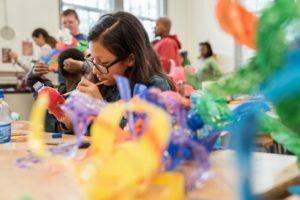 Registration for CORE Arts Camp and PLUS Camp opens every spring semester, and space for camp fills on a first-come, first-serve basis. Quality instructors from all over the country ensure that children develop both process and product, and stretch their creative muscles while attending MSAI each year. Registration begins Monday, January 14, 2019 at 9:30 a.m. Registration for the Janice Wyatt Mississippi Summer Arts Institute is now open! Please click HERE to be redirected to our payments page. In your payment confirmation email, you will receive a link to our online registration form. Please click the link to the appropriate camp and fill in the form to complete registration for your child. Please make all checks and money orders payable to Delta State University. Questions? Feel free to reach out to our offices at 662-846-4844. Or email our arts education coordinator at cholder@deltastate.edu. Still not sure about what our camps have to offer? Then read on for more information about MSAI! For the past 20 summers, the Janice Wyatt Mississippi Summer Arts Institute (MSAI) has impacted the lives of countless emerging artists by providing a one-of-a-kind opportunity for students to gain broad exposure in all artistic disciplines. The goal of MSAI is to encourage young artists to begin or continue their pursuits in the fine and performing arts. MSAI provides high-quality instruction and enrichment for a wide range of participants, beginning with age 5 and continuing all the way to graduating high school seniors. Campers ages 5-11 attend PLUS Camp, a week-long, performance-oriented day camp packed with tons of energy and fun activities. Campers ages 12-18 immerse themselves in a two-week, multi-faceted, residential CORE Arts program. Both programs will feature final showcases that demonstrate the hard work and immense dedication of our young artists. Through MSAI, you can develop your interests and abilities, and achieve what you once thought impossible. You can explore different disciplines and open doors to new opportunities. Please join us this summer and expand your horizons through the arts. It is sure to be a rewarding experience you will never forget! Exposure to the arts contributes to the overall cognitive and social development of children. 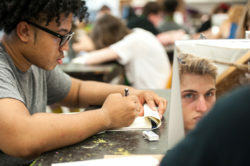 Providing students with a creative outlet of expression can improve academic achievement, accommodate a wide variety of learning styles, promote diverse multicultural perspectives, and aid in the development of positive self-esteem in adolescents. Arts education is an essential component in preparing youth for their future careers. Aspects such as team-work, self-discipline, and communication skills are promoted throughout the fine arts curriculum, and provide students with useful tools that will help them achieve their goals and aspirations. For more information on our year-round Arts Education opportunities, feel free to drop by the Arts Education Office located in the main lobby of the Bologna Performing Arts Center on campus at Delta State University. You may also contact our arts education coordinator, Cade Holder, at cholder@deltastate.edu or at 662-846-4844. The Bologna Performing Arts Center is dedicated to providing exceptional artistic and educational opportunities to children in the Mississippi Delta region. 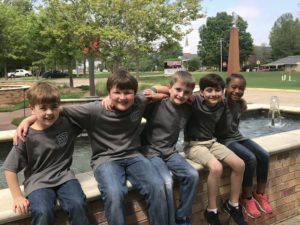 Through our affiliation with Delta State University, we are able to offer a variety of programming to suit the needs of local families, school children, and educators. Each year, we work to engage children and community members in a number of different programming initiatives with local and state arts organizations. Please explore all of our arts education offerings to learn just what BPAC Arts Education can offer you and your family! One of our on-going arts education initiatives is the School-Time Matinee Series. Each year, we welcome approximately 10,000 children from PreK-12th grade, showcasing performances on the BPAC mainstage for younger audiences. To reserve seats for your class, download our 2018-2019 Order Form and submit with full payment to the arts education office. We will begin processing orders on Monday, August 13, 2018. Through our scholarship ticket programs sponsored by Double Quick Inc. and the Community Foundation of Northwest Mississippi, we are able to provide a number of rural school districts with $1 tickets to our matinee shows. Our Arts Beyond the Stage partnership with the Delta Arts Alliance supplements the performing arts experience with a fine arts craft and is usually held for one to two performances per year. We also work with Delta State University Admissions to provide access to campus tours for middle and high school audiences who attend our performances. Diary of a Worm, a Spider, and a Fly-Wednesday, October 10, 2018 at 9:30 and 11:30 a.m. The Magic School Bus: Lost in the Solar System-Thursday, November 1, 2018 at 9:30 and 11:30 a.m.
Junie B. Jones-Friday, March 29, 2019 at 9:30 and 11:30 a.m. Launched with the support of grant funding and community partnerships with the Delta Arts Alliance, the BPAC will provide reduced price books based on STMS performances, and arts activities that complement the productions on the 2018-2019 season. Books will cost $1 per student, and are reserved on a first come, first serve basis. Priority reservations for books will be given to public school groups in Delta Counties. Your school group must attend the STMS performance on which the book is based to be eligible to purchase books. Books cannot be placed on hold—payment must be received in order to confirm book reservation. If books are still remaining two weeks prior to the show, private and homeschool groups attending the STMS performances will be able to purchase the books for the reduced $1 ticket price. Order forms for Read It, See It, Be It will be made available when STMS tickets go on sale. Thanks to the King’s Daughters and Sons Circle Number Two, the Community Foundation of Northwest Mississippi, and the Delta Arts Alliance for their support with this literacy initiative!